My friend Lisa got tagged for a fun tag. If you go to your sixth folder in your My Pictures folder, and select the 6th picture in that folder, post the image and details if you can remember them! She didn't tag me because I NEVER return the favor LOL but this one is pretty easy so I thought it would be fun. This is a picture from a few years ago when I first started putting Lori and Wiggle out together with other horses. They were having a good run and letting off steam and we still had a bit of grass for them to eat. If anyone else feels like joining in go for it, I am supposed to nominate 5 or 6 people but will leave it up to each of you as individuals as to whether you want to do it or not. 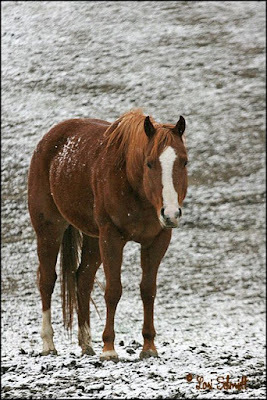 We have had snow and sub freezing temps the past few days which I am dreading more of and this is a picture I took of Cayenne in the field yesterday evening (it was still snowing) while they were turned out so their stables could be cleaned. She looked so sad and it is a reflection of my feelings today. The mare that we brought back from Iowa a few weeks ago has aborted the fetus she was carrying to be born next year. She must have been 4 - 5 months along and this was very distressing. It was a stud colt and probably would have also been palomino like my new baby Goldie who would have been his full sister. I am looking into the possibiity that she was carrying twins but can't be sure right now. 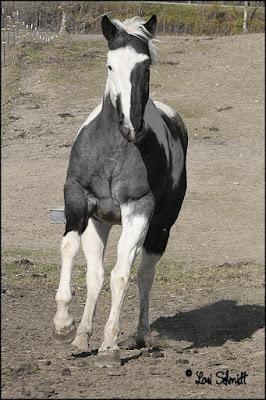 Twins arent uncommon in horses but their surviving full term is not common at all although there have been many who have. So it was a sad day for me yesterday, seeing that little thing about 12 - 18 inches long with all of its features, ears, tail dock, perfectly formed legs and boy parts, nostrils, tongue and hooves broke my heart. Judging by the response I didnt get the last time that I broached the Mustang subject it makes me think that either everyone is too busy with their own lives (believe me I know all about that), they are not really animal lovers and dont see the importance of this subject or they are too shy to make a stand and be heard publically. 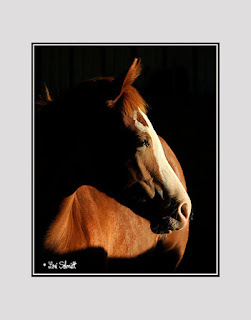 I subsequently asked Carol Walker one of the members of a few equine photographer and artist groups that I belong to who I have referred to before on previous posts, about it. I am going to quote her reply to my question on how factual this information is which I thought might be very useful to those of you that do care and believe me every e-mail towards this cause can make a difference, we are hanging on by a slim thread at the moment but this has given a glimmer of hope. • Request that Mr. Obama appoints a Secretary of the Interior who cares about our public lands and our wild horses - the BLM needs change from the top down! • Write about your hopes for the future of wild horses in America—the BLM’s “management to extinction” policies must be changed "
"They interviewed me just after having gotten home from the advisory board meeting. The BLM will continue to round up horses this coming year - they are currently rounding up one herd in Utah, the Sulfer herd, they will be rounding up a herd in Utah in 2 weeks and removing 447 horses, they plan to do "emergency" removals in Nevada of about 2000 - 3000 horses and in Wyoming they will remove horses if the State of WY demands it, and they are also planning to remove 60 horses from the Pryor Mountains. Carol Walker "
The statement that got to me the most was in the one article that Carol linked us to, the last two paragraphs "There are eight million head of cattle on public lands and only 23,000 horses. Who's eating the forage?" she asked. "These are our public lands," Walker added. "These are our horses. We should have a say in how they’re administered and we don't." I am going to post this as it is and hope that all the links work and are correct. I will check them after pubishing and make any changes if need be. Okay that is my bit for the soapbox again for now. I hope some of you will take the time to read this and give it some thought, in a way the American people are being led down the same path as the mustangs and we are willingly let it happen because we are not being told the truth and being educated on the facts. ((((Hugs))) and thanks for listening. We woke up to a snow covered deck this morning. It wasnt sticking to the ground because the recent rain and the ground is still a bit warm for it so it melts. It settles on the roofs and branches but that is about all. It snowed gently and sometimes quite hard all day and our temperature was just below freezing all day. The wind is what makes it unpleasant. I filled all the bird feeders today and the birds swarmed them. 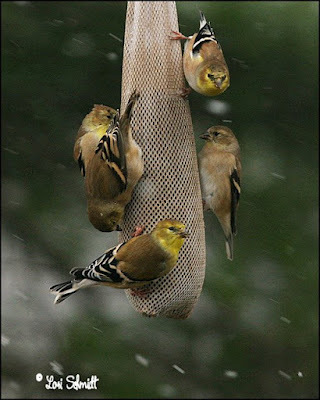 These little gold finches with their winter woolies made a feast of theirs, thistle seeds, and this is the most birds I have seen on the sock at one time. There are 5 here, one is slightly behind the other but there was a sixth at one stage. 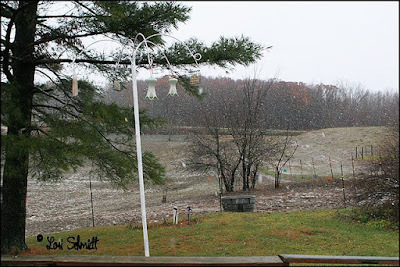 Of course the white streaks are the snow, the wind was blowing which makes it very cold out there. Gonna make this a short one, after my last few posts I will give you all a break. I was hoping that some more people would step up on this subject but only two have even though the one just has a first name and the other is anonymous. I have spent just about the entire day thinking about what I posted and what they have had to say and show us and what continues below is the result. Again I reiterate, these are my own personal feelings and I would invite any constructive discussion on the subject. Okay I knew this would open a can of worms but I hope that something positive can come from it. You will have to excuse me if I am not always clear I struggle to put my feelings into words that make them easy to understand what I am trying to get across which is why I would never make a good teacher. I also understand the risks of the internet and making myself a target but horses are my life and that can't be avoided, and I am willing to risk that for them. On the subject of the Mustangs, that is what I was saying if you read my post again, they would be better off being turned back into their natural environment where they will take care of their own needs with proper management by people who know what they are doing and don't have any financial gain and greed from the process at a far reduced cost. Yes the cattle industry wants the land to graze their cattle, public land I might add, and the horses are suffering because of it. I hope that anyone reading this has looked at that post from a few days ago and had a look at the books and calendars made up by two fellow photographers from their photography, compassion for the mustangs and many years of work. website quoted for anonymous but that is all. Please dont hide behind you anonymity and please believe me when I say I am in no way pro slaughter especially for human consumption. It is illegal here in the USA to eat horse meat. retirement and if things improve and they are still breeding sound they will go back into service, if not they will become yard ornaments. 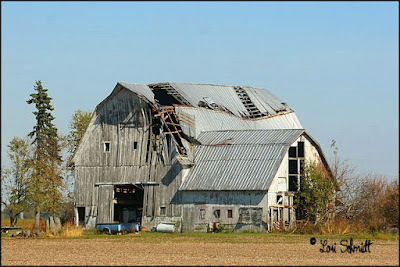 I don't work other than my photography and caring for my animals, for health reasons and my husband is quadraplegic and has been for 26 years, so we have a very limited income. This was his dream and his and my views definitely differ but he has respected my feelings and that is now why we still have all of our babies who are now all grown up and have no good homes to go to, I am the compassionate side of our relationship and believe that these animals are my responsibility and I am not going to cop out on it and just turn a blind eye and get rid of them and let them become someone else's problem and forget about the consequences. I refuse to let him take them to sales here in Indiana because I am terrified of them ending up in the wrong hands, hence I have 16 and am bankrupting myself to keep them healthy and killing myself in the process. Just about every one of my horses has been with me since birth and they are like my children each with their own personalities and quirks. by what I saw, babies with their legs completely skinned and opened from the fetlock joint to the knee where all you could see was the bone, gashes in their heads and all over their bodies, frightened, thin and unhappy and it set the standard for me from then onwards and is the only thing that I think about when I think of a horse sale. In the UK this would be completely unheard of, the animal protection laws and rights are far more stringent than they are here. There you would be hung drawn and quartered for abusing any animal in any way. long time ago and is a long supressed bad memory and is part of my healing process that I am going thorough mentally at the moment (another long story). with us at the moment who was so sick when we found her 6 weeks ago, she was like a walking skeleton, but is putting on weight daily despite being 23 years old so it is a slow progress, they are all fat and sassy. I have paid the $7 - $8 a bale for square bales (60lb), using 5 to 6 bales a day (last year) just for hay let alone grain which has doubled in price. I feed whole crimped oats now which we crimp ourselves every day to make the food go as far as it can, no more undigested whole oats passing through their systems. I will post something about this sometime soon as it is a cost saver for anyone who has horses and a very small inconvenience which is far outweighed by its benefits. They each have their mineral blocks too and I work on a rotation system to get them out in to the fields to get regular exercise when the weather permits and not just exist in a stable all their lives. They may not get their feet trimmed as regularly as they should or get wormed as regularly as they should but they are happy and healthy and I see that every morning when I walk into our barn and am greeted by their eager faces. but I really believe it is the situation and there has got to be another solution to this problem. I can only imagine the horrors you saw and documented at DeKalb. I have seen a few videos on UTube that I have not been able to watch more than a few seconds of without being a sobbing hysterical wreck. I suppose the same would apply for cattle, pigs or sheep, I have never looked into those issues but maybe I should and I am willing to bet that there are regulations coming out of the ying yang making the whole process more humane. My apologies if PETA were not involved, although I am sure they were somewhere in there. I do understand the reasons for wanting to close the slaughter houses in Texas and Illinois but feel very strongly that this has just made the horses suffer more. The closure of the PMU farms did not help us a few years ago either because those horses flooded the market in the thousands as the conservationists were abhored by the way the mares were kept and the Drug companies had to find another way to produce Oestrogen synthetically for their market, and didn't renew their contracts with these farms. I wonder how many people know that that is where Oestrogen that they consumed and used came from? PMU = Pregnant Mare Urine. This was all at about the same time as all the controversy about the slaughter houses were starting to get attention, bringing the price of horses down and making it more profitable to sell a horse to the killers than to buy it as a companion animal. I rescued one of those and would have rescued more if it was in my capabilities but I already had 20 other horses. There are just too many animals and not enough people who care enough to put their animals lives before their own. We have taken the first step but it has just created another huge problem, so now what is the solution to the situation presented because of the first victory. The days of breaking horses to ride with force and breaking his spirit as a result, have gone, people are realising that horses respond to kindness and calm and patient teaching far better than they will to be forced into doing something against their will and abused and then hating what they are doing and people in the process. They have personalities, emotions and respond to kindness the same way in which a cat or dog or a child for that matter would, and they are VERY intelligent. care has been resolved this will be an ongoing argument and problem and also the right people have been educated, these being the politicians, the people who have all of our futures in their hands. I wish I could do more and the first thing I think about when I read about the floods and wildfires and tornados and hurricanes, is the animals. I do have concern for the humans too of course but it is the animals that I think about first and we never hear about what happens to them in these circumstances. I remember a few years ago, (think it was in Oklahoma) a woman who was a Barrel Racing Champion and her friend and trailer were crossing a bridge after a show on their way home when it collapsed and they were all killed. I remember looking at the article and seeing no mention of the horse trailer or horses who perished there, at least not in the news in our area, just the people. I hope that this subject can be kept open and used as an information sharing opportunity rather than a negative thing, because I think we all have things to learn, and what we hear isnt always what is actually happening and education is the only way that we are going to make things better for us and our animals. We have to find a happy medium where everyone and everything benefits rather than tipping the scales in one direction only. I have been told I am too emotional but that is who I am and nothing will change that. In closing, I do not condone the slaughter of horses for human consumption or any other reason for that matter but we need to come up with a solution because all the solutions thus far have just made them suffer more than they were before. There are too many unscrupulous people with no hearts out there who dont give a damn. If you have managed to read all of the above without skipping a few paragraphs you deserve a medal and thanks I appreciate it, it has sure helped me to put things into some sort of perspective in my mind and I hope that in some way this will help our horses and bear in mind these are only my personal observations, rationalisations and feelings on this subject, I just wish I had the answers. I am going to address the post from yesterday and the replies I have had from a few people regarding this situation in a seperate post but wanted to do a post as an update on what is happening here on a personal level for those of you who don't want to get involved in the other matter. This is the one filly I brought back from Iowa a few weeks back, she is the two year old filly Dawn's momma and her name is DB April Dawn because she was born on 1st April 2002. Now bear in mind that this filly has just spent nearly 4 years in a huge pasture with no human contact other than to be fed with a herd of mares and a stallion. She had two weeks training on her to break her to ride before she went to Iowa and only had one foal out of the three foaling seasons which was Dawn. The young lady with her is Kendal, the daughter of a friend of ours who used to come over and did a bit of work with April for a few weeks before she went to Iowa. Kendal has never ridden solo, without being on a lead rope and someone on the other end of it. We took April out of our field, worked her for a bit, put a bridle and saddle on her and Kendal jumped up on her and was walking and trotting around the arena like they had been doing it all for years, after only about 5 minutes!!! Not only is Kendal a natural horsewoman (it is amazing to watch someone who "has it" when they first start riding) but April is a great minded mare. We are hoping that Kendal and April will be able to compete in the 4H County and Indiana State Fairs next year along with BB the mare who's picture I had in yesterday's post. BB will be her halter prospect and April will be her riding prospect. This is a very dedicated 11 year old and is not happy with someone doing the work for her and then handing her the reins, she does all of it herself. I do have pictures of her looking at the camera, but thought with the internet the way it is at the moment I would rather post this one. Here April is just following her around without any lead rope and turning stopping and walking off with Kendal with no aides other than her voice and body language. I am very excited about this venture, I am not competitive so this is a great opportunity to get some of our horses out there for people to see and then maybe we can sell some of them to good caring homes. Hopefully she will get a few Pinto shows in next year too. We used to do Catblogging Friday here on blogger and I have got so far behind that I rarely post as you have all seen, so here is a belated Friday catblogging picture. 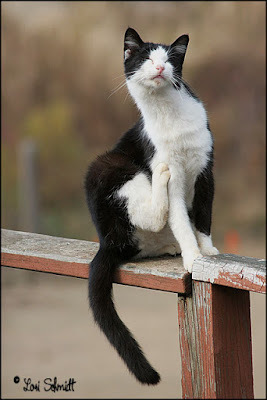 It is my barn cat Sylvester having a good old scratch. He is my best mouser in the barn LOL. It is absolutely freezing here today, we had about 1.75 inches of rain over two days which was great but now the temps are plummeting and we are barely coming above freezing with wind chills below freezing. Al the horses are indoors because the wind is blowing, if it wasnt windy I would turn them out but the wind just makes it unbearable to be out there and I am sure the horses feel the same way. I will be making another post later, I am just preparing it and trying to get some facts and links to go along with it. It is going to be a looooong post be warned LOL. It has been a while again and I really wanted to follow up on my last blog entry about the Wild Mustangs. Below is a picture I took of one of our mares the other day, her name is IMA Blue Dudette, she is a Blueroan Paint mare and has a beautiful temperament. On the Mustangs story I will address some of the comments, firstly Carmi it is so good to hear from you again!!! Thanks for stopping by. Yes the Mustang saga does go much much further and I am going to do a bit more searching on links etc. to better educate myself and hopefullly pass on my findings. I know there is huge pressure on BLM at the moment and believe me these people are being followed very closely and I dont think will be able to pull off what they are planning. There are apparantly about 30 000 wild mustangs in "holding facilities" which is costing a fortune when if they had just managed them in the wild better it wouldnt be costing them 27 million a year. The so called animal rights people say that adopting the horses out is the answer but these poor animals can end up in homes where people know nothing about horses let alone wild ones, and there are thousand of horses from all over the industry including the racehorse industry horses standing starving in "self proclaimed rescue holdings" and people's back yards because the novelty has worn off or in these economic times they "cant afford to feed them" which still doesnt explain why they dont get water either. I have unspeakable pictures in my mind of these poor animals that I will never be able to erase. Be very wary of these associations if you are thinking of donating money as some of them are run by unscrupulous people who only have their stomachs to worry about let alone the horses, and I bet you will find some of them smoke too! For the price of a box of cigarettes you can get a bale of hay which will more than adequately feed a horse for a day (60lb square bales of good grass or alfalfa). I could go on about this all day but will try to find articles that will back up what I am saying and post them. Suffice it to say (and this is my opinion) PETA made a big mistake having the horse slaughter houses closed in the USA, because all that has done is make our horses suffer longer cramped journeys in terrible conditions to Mexico and Canada where they have processing plants. In Mexico they also have blood sports that involve horses. I wont go there right now. If PETA had focused their money and efforts on improving the handling and transporting of horses for slaughter (for whatever reason they have to find themseves on a journey to such a place) it would have been far more appropriate. I choose not to eat horse meat and that is everyone's perogative but I draw the line when it is making thousands of animals suffer every day needlessly. I dont think you have to register to view the article, if anyone has problems it is well worth registering, it is free and has all sorts of useful horse stuff in it. Off my soapbox! and I hope I dont get flamed for any of the above, these thoughts are purely my opinion and the last I heard there was freedom of speach in USA. We got our first snow today!!!!! Who would believe a week ago we were wearing T shirts and having temps in the 70s!! Below is a pic of it from inside our house, it didnt stick because it wasnt quite cold enough to keep it frozen once it had hit the wet ground from the rain. Okay it feels good to get that off my chest and I am sorry if my next few posts follow along the same lines but it is something I really need to come to terms with and writing about it helps me tremendously. I promise I will try to find some pretty pictures to post as well so that if you dont want to read this type of stuff you can just look at the pictures. It is very personal (like politics) and sometimes things are better left unsaid and I respect that. Today I am devoting my post to the Wild Mustangs of the American West. This has become a very controversial subject and one that I am also passionate about although I have not seen them for myself. The post today is made in the hope that it will educate some of us as to exactly what is happening to these beautiful animals, it is not what we are being led to believe is happening. One of my fellow photographers, Carol Walker, has been photographing these herds for many years and if you visit her website you can find all the information that you need to see just what a tragic and urgent situation this is. She published a book and calendar this year with photos of all the herds she has followed and come to know intimately and tells what is happening to them. She is offering the book and calendar together at a special price for the holidays and I hope that you will each consider purchasing one of them because part of the proceeds go back to helping these horses and if their story doesnt bring tears to your eyes I will be surprised. I am going to post a few links to the book and calendar which is for purchase and to photographs that she took recently during a "round-up" by the Bureau of Land Management (BLM). I have to warn you that these images are VERY disturbing and the fact that she and her colleagues had no option but to sit on the sidelines and record the events as they unfolded must have been very painful for them. 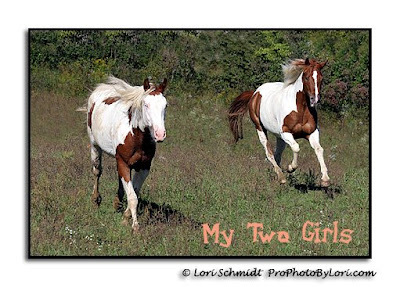 I am also posting a link to a second photographer, Cyndie Planck, who I am associated with who had the wonderful opportunity of photographing wild horses in a different area to the ones that Carol covers but these animals are suffering a similar fate and again, take a look at the calendar, it would make a wonderful Xmas gift and also shows the beauty surrounding these animals. Some other links but I am sure with a bit of research you will find many that actually show what is actually happening is not what we are hearing. All of this goes hand in hand with the closing of the horse slaughter houses in the USA and the continued battle against abuse that horses going to slaughter have to endure and these mustangs are mostly going to end up in Mexico and Canada for processing. This is a whole nother story. I will get into that next. I am sorry this is such a morbid post, but if I can educate even one person on what is happening it will be worth it. There are many people who are involved in the horse industry that dont know this is happening let alone people out of the horse industry.